All right, I know… I should not refer to “Third World markets”, but rather to “emerging economies” to be more politically correct! Let’s establish the fact that being politically correct is not my forté and that when referring to countries such as India or Peru, I do realize that in no way can they be referred to as “Third World” in today’s context. However, such countries are still totally similar to true Third World markets, at least from an online perspective. Now, let’s consider these locations not as country-specific, but rather as language-online-market shares. Let’s take French as an example. Of course, French involves wealthy internet platforms such as France, Luxembourg, Belgium, Switzerland, Quebec, etc. However, French also represents close to half of Africa, featuring countries as poor as Chad, Congo, Niger, Mali, Burkina Faso, or Gabon! At first, it would not appear that such countries could be viable markets. However, like in most “distressed economic platforms” (isn’t that a nice euphemism for being politically correct this time?!? ), the middle class is pretty much nonexistent. In other terms, you are either “dirt poor” or “stinky wealthy”. Being poor in this type of country comes with every extreme aspect of poverty where the connotation of wealth is oftentimes lavishly beyond what we experience in the West. Being wealthy in Africa means being really wealthy, like in Southeast Asia, Latin America, etc. Furthermore, being that the illiteracy level is so overwhelming in poor countries, those online are the affluent ones. This is the big difference with Europe or the US/Canada, where internet users range from “blue collars” to top CEOs. When marketing your products in the US, aside from a fierce competition, one needs to be able to pinpoint/target their market precisely, contrary to Third World countries where the online online users can generally afford what you have to offer. Additionally, “weaker economies” rely 100% on import of everything ranging from goods to services – they manufacture little to nothing, and depend entirely on interacting business-wise with richer countries. Also, it is to be considered that such countries are being much less solicited by your competition than strong financial platforms. 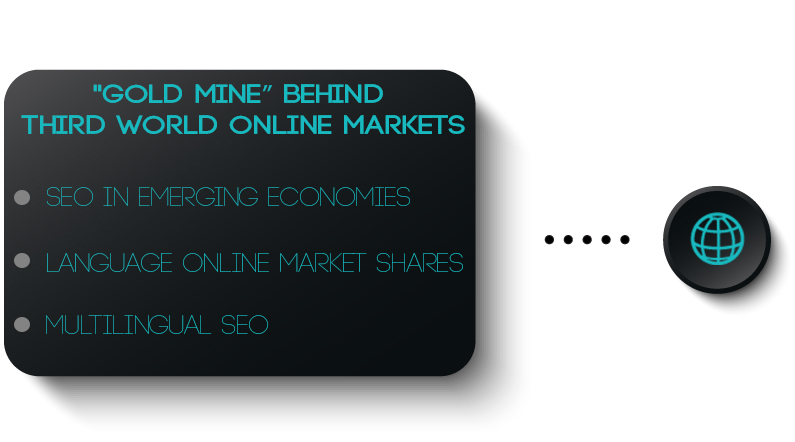 In other terms, the disparity between the social classes, in conjunction with the need to import and a lesser competitive business world, oftentimes makes such countries the most untapped “gold mines” which you could ever consider going after in terms of international online expansion. One more thing to consider is the fact that when you’re wealthy in a country like Togo or Malawi, you have much less outlets to spend your money in terms of entertainment. In other terms, wealthy individuals living in countries “limping behind” (oops, sorry for that one! ), rely much more on online interaction for any consumer goods available online and not in their country. Once again, this is the big difference, for example, with the US and Europe. Chances are that what you can buy online can be also found at a local retail channel. Not so in “Third World” countries… Either you can get it online or need to fly 10 hours to buy it! On another note, online Third World markets usually feature a much higher educated pool of individuals – you see many Indians and Pakistanis studying in the UK, but I dare you to find an Englishman that went from Cambridge University to perfect his degree in Mumbai or Islamabad! For example, when you come from a wealthy family in Africa, kids end up in top-private schools either in Western Europe (France and the UK in most cases), the US or Canada. As an example, MSEO.com has promoted a leading US cement manufacturer. Such company has embraced all 28 languages which we have to offer. I recently spoke to their CEO, who reported to me that out of all the work we did for them, the most profit which was generated came from Pakistan (Urdu) and French with Senegal and Ivory Coast… Go figure! Anyway, over the last 11 years of offering multilingual search engine promotion services, we have witnessed countless case-studies to fully back up what I am writing herewith. Time has come to think out of the box and to explore the few remaining untapped wealthy niches online… Think “Third World” and capitalize on these so-very-misperceived online communities!